This is a guest post by Rachel Rodman. Photos by Daniel Murphy. Every U.S. state has its own set of symbols: an official flower, an official tree, and an official bird. Collectively, these organisms form the stuff of trivia and are traditionally presented in the form of a list. But, lists…well. As charming as lists can sometimes be, lists are rarely very satisfying. So I decided to try something different. I am not, of course, the first person to be unhappy with the eclectic, disordered nature of many biological assemblages. In the 18th century, Linnaeus developed a classification system in order to make sense of that untidiness. Kingdom, Phylum, Class, and so on. In the 19th century, Darwin set biodiversity into an even more satisfying intellectual framework, outlining a model that linked organisms via descent from a series of common ancestors. And, as early as 1837, he experimented with a tree-like structure, in order to diagram these relationships. Following Darwin’s lead, I’ve worked to reframe the state flowers and state trees in terms of their evolutionary history (*see the methods section below). And today, in honor of Darwin’s 209th birthday, I am delighted to present the results to you. Let’s start with the state flowers. In this tree, Maine’s “white pine cone and tassel” forms the outgroup. 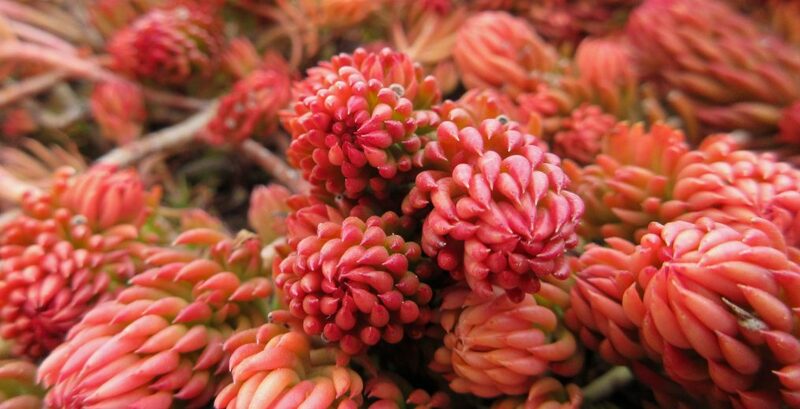 Among all the state “flowers,” it is the only gymnosperm—and therefore, in fact, not actually a flower. Notice, also, that the number of branches in this tree is 39—not 50. Most of this stems from the untidy fact that there is no requirement for each state to select a unique flower. Nebraska and Kentucky, for example, share the goldenrod; North Carolina and Virginia share the dogwood. With the branch labeled “Rose,” I’ve compressed the tree further. The state flowers of Georgia, Iowa, North Dakota, New York, and Oklahoma are all roses of various sorts; with my data set (*see methods below), however, I was unable to disentangle them. So I kept all five grouped. This is a rich tree with many intriguing juxtapositions. Several clades, in particular, link geographical regions that are not normally regarded as having a connection. 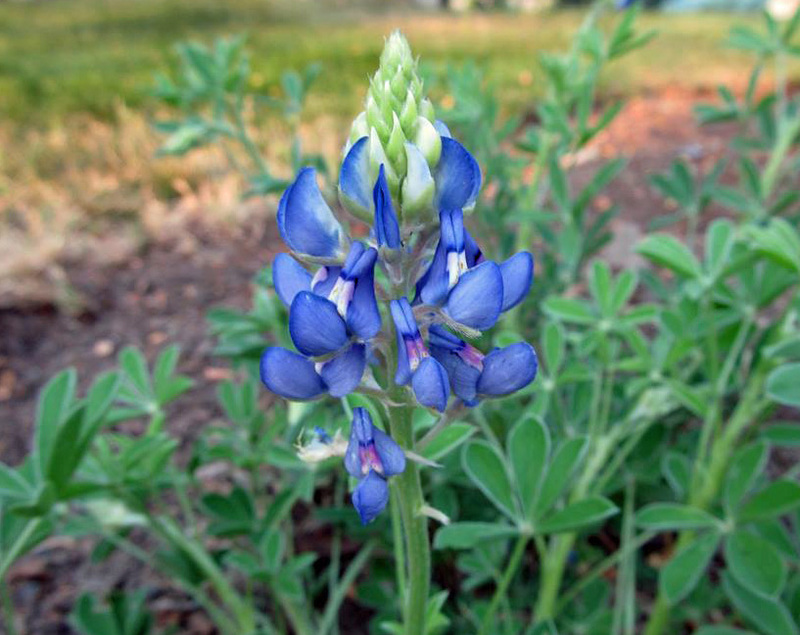 Texas’ bluebonnet, for example, forms a clade with Vermont’s red clover. So, similarly, do New Hampshire’s purple lilac and Wyoming’s Indian paintbrush. The second tree—the tree of state trees—is similarly rewarding. This tree is evenly divided between angiosperms (19 species) and gymnosperms (17 species). Iowa’s state tree is simply the “oak”—no particular species was singled out. To indicate Iowa’s selection, I set “IA” next to the node representing the common ancestor of the three particular oak species: white oak, red oak, and live oak, which were selected as symbols by other states. Arkansas’ and North Carolina’s state tree, similarly, is the “pine,”—no particular species specified. I’ve indicated their choice in just the same way, setting “AR” and “NC” next to the node representing the common ancestor of the eight particular pine species chosen to represent other states. 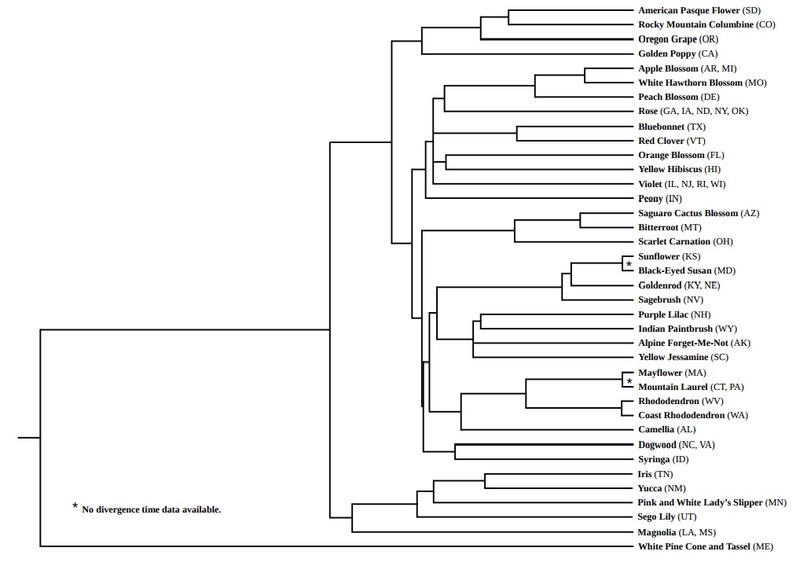 In this tree of trees, as with the tree of flowers, several clades link geographical regions that are not usually linked—at least not politically. Consider, for example, the pairing of New Hampshire’s white birch with Texas’ tree, the pecan. 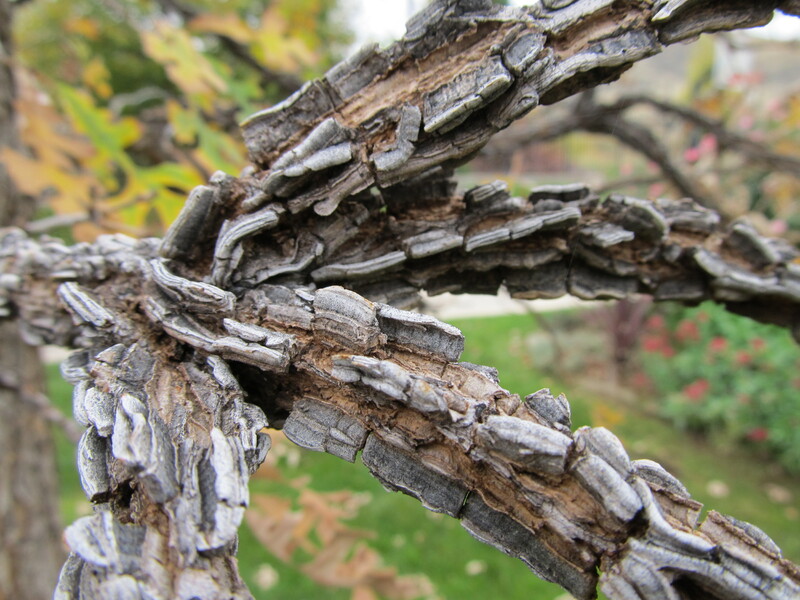 The corky bark of bur oak (Quercus macrocarpa). Oak is the state tree of Iowa. The point, instead, was to suggest that these stories can coexist and be simultaneously appreciated alongside a much larger one: the many million year story of plant evolution. With Darwin’s big idea—descent with modification—the eclectic gains depth and meaning. And trivia become a story—a grand story, which can be traced back, divergence point by divergence point: rosids from asterids (~120 mya); eudicots from monocots (~160 mya); angiosperms from gymnosperms (~300 mya), and so on and so on. An evolutionary framework really does make everything—absolutely everything: U.S. state symbols included—more fun, more colorful, more momentous, and more intellectually satisfying. To build these two trees, I relied on a data set from TimeTree.org, a website maintained by a team at Temple University. 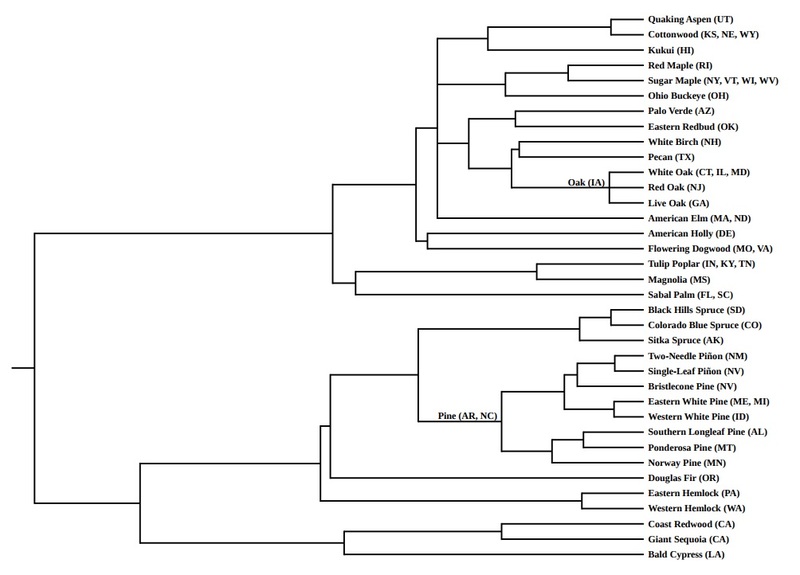 At the “Load a List of Species” option at the bottom of the page, I uploaded two lists of species in .txt format; each time, TimeTree generated a phylogenetic tree, which served as a preliminary outline. Later, once I’d refined my outlines, I used the “Get Divergence Time For a Pair of Taxa” feature at the top of the page in order to search for divergence time estimates. As I reconstructed my trees in LibreOffice, I used these estimates to make my branch lengths proportional. Rachel Rodman has a Ph.D. in Arabidopsis genetics and presently aspires to recontextualize all of history, literature, and popular culture in the form of a phylogenetic tree. Won’t you help her? This entry was posted in Uncategorized and tagged Botany, bur oak, Carl Linnaeus, Charles Darwin, evolution, flowers, genetics, guest post, phylogenetic tree, phylogenetics, phylogeny, plant systematics, plant taxonomy, Rachel Rodman, state flowers, state symbols, state trees, Texas bluebonnet, Trees. Bookmark the permalink. A wonderful exercise…I love the two hemlocks, eastern and western. It’s really hard to comprehend how a state can just have “oak” or “pine” as its state tree. Oh well!